152099. 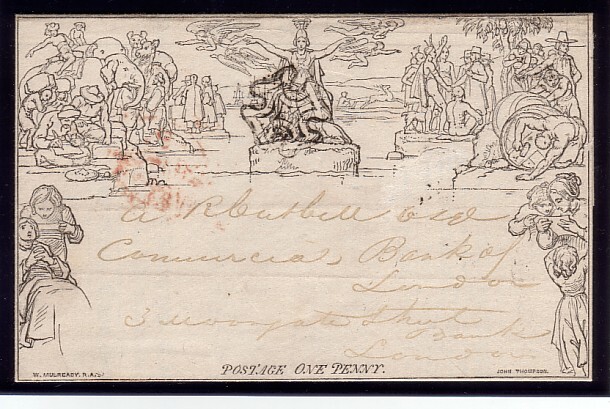 1d Mulready front mounted on card for display: addressed to Leeds with a Leeds date stamp for September 16th 1841. 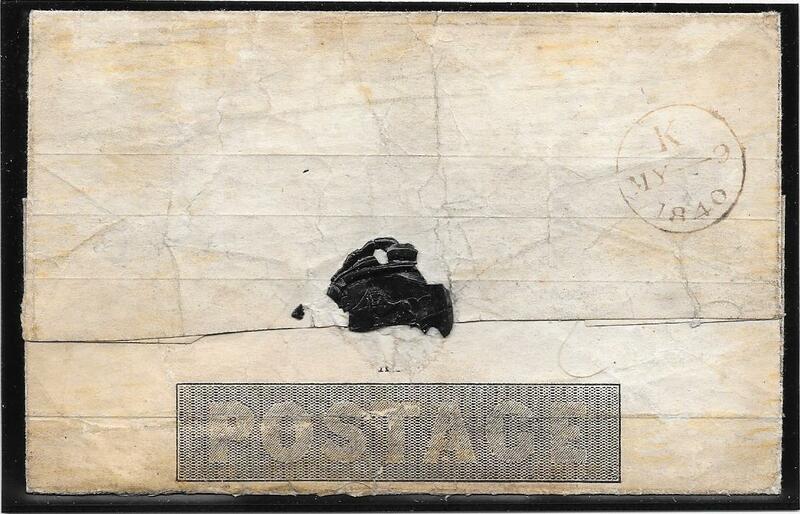 Very fine black cross and a HOLLINGSGREEN PENNY POST in black. 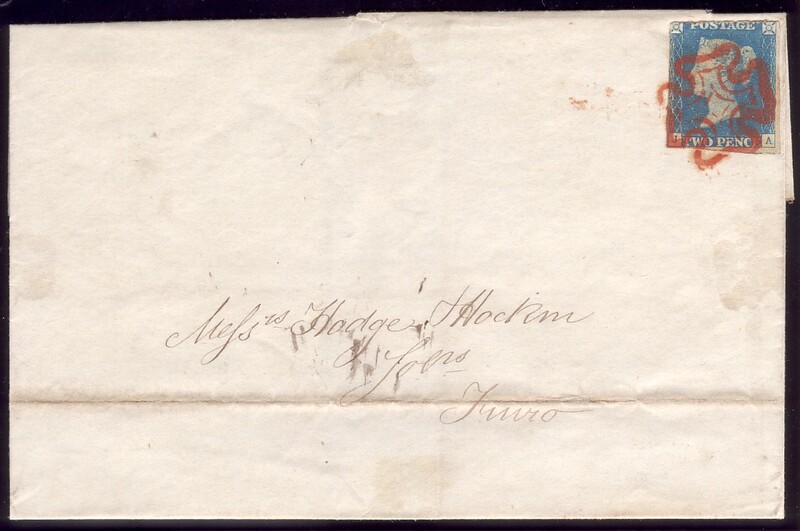 This is a rare Penny Post cancellation which was unknown except in GPO records before January 10th 1840. 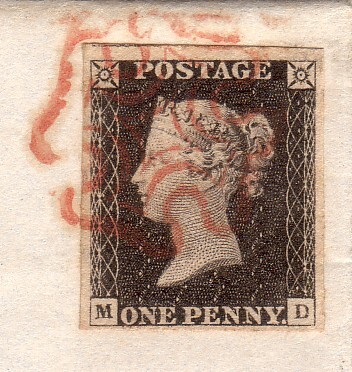 The County Catalogue lists this strike as LA 523, only recorded used in 1844 and then in RED. Hollingsgreen is a very small village near WARRINGTON: it is likely the MX was applied in Warrington. This cross is unlisted by Rockoff and Jackson. A rare combination of cancels which display well. NB: the overall bowning is a trick of the scanner. 1204. 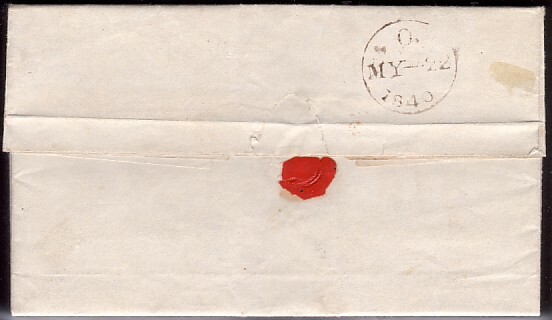 1d Mulready letter sheet, stereo obscured by wax seal, uprated by an almost 4-margined 1d red imperf. two on the 1d red Contrary to Regulations. 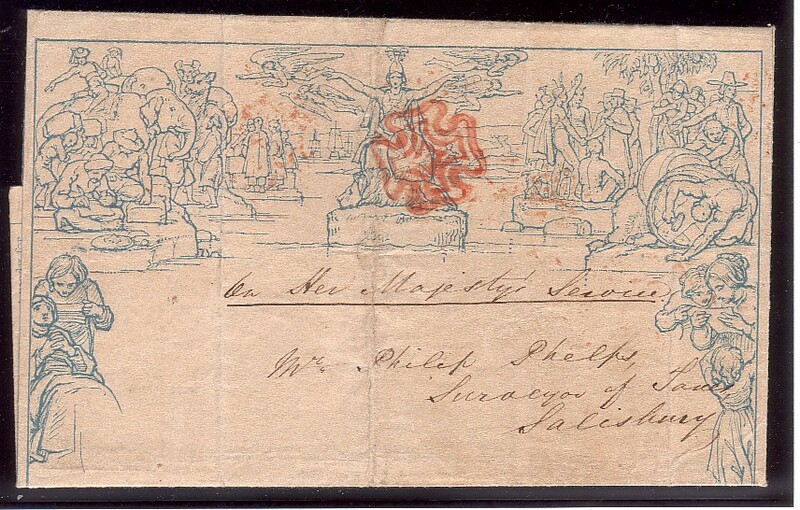 Salisbury date stamp for November 11th 1842 and a receiving Pontefract cds for SUNDAY November 13th 1842.
record only one other Salisbury cross on a Mulready and that not uprated with a 1d red. 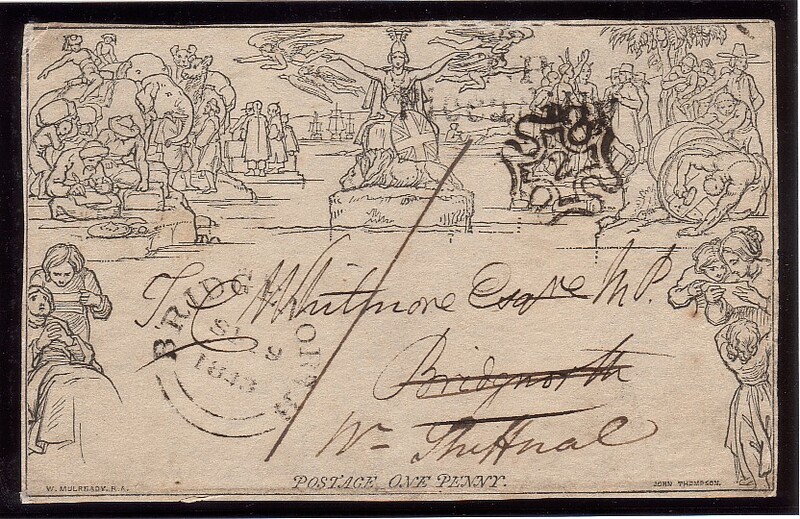 We cannot recall seeing another such Mulready with date stamps of the place of origin and destination on the front. Some creasing but an attractive and rare example; priced by Gibbons at £14,500. 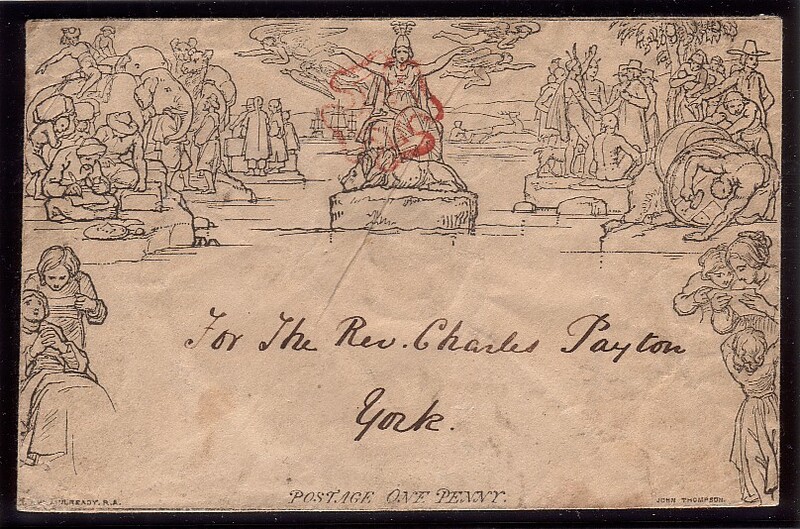 with date stamp on reverse for MAY 28th 1840. 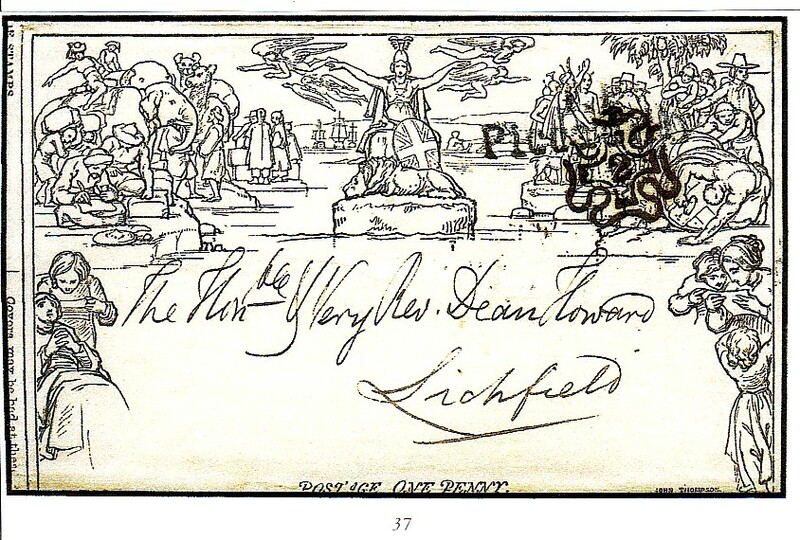 Superb dark red cross and a pen notation: ‘Stamp belongs to the Bradfield Rectory Collection’. Some creasing and light wrinkling but overall in fine condition for such a considerable rarity. 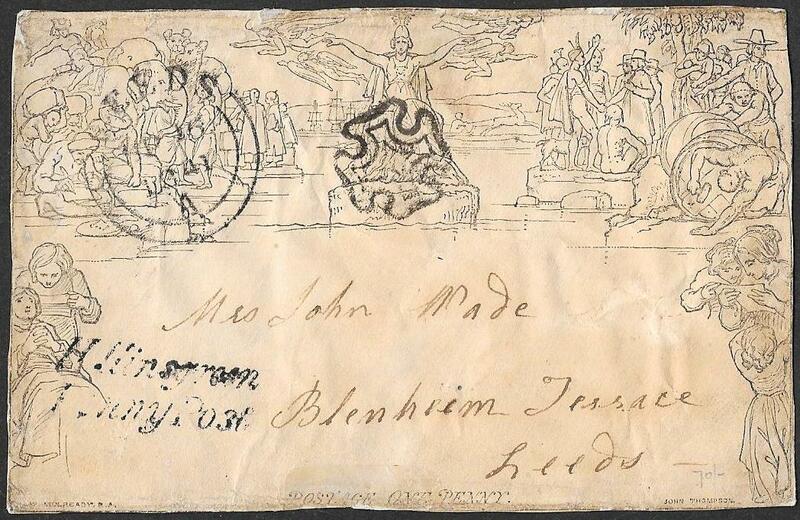 2d Mulready used in May 1840 and this total figure includes both Letter Sheets and Envelopes. His detailed list does NOT include an example for May 28th 1840. 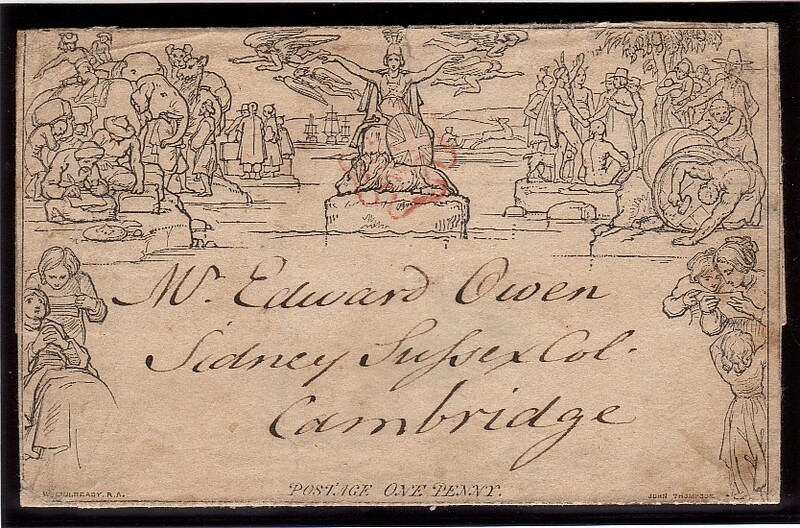 He records 86 examples of First Day 1d black usages on May 6th 1840 which emphasises the rarity of this 2d Mulready. in the latest, 2011 Edition of QV Volume 1, at £17,000. 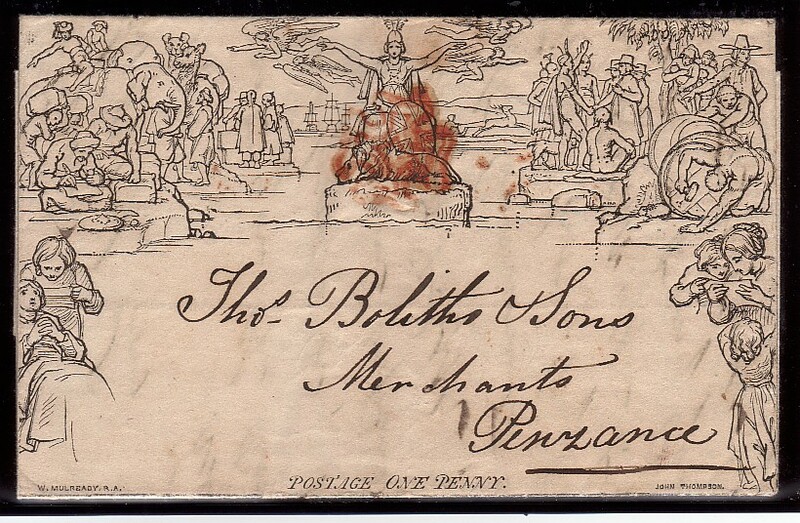 on May 26th 1840 and priced at £17,000, which is the example listed by Jackson for that date. 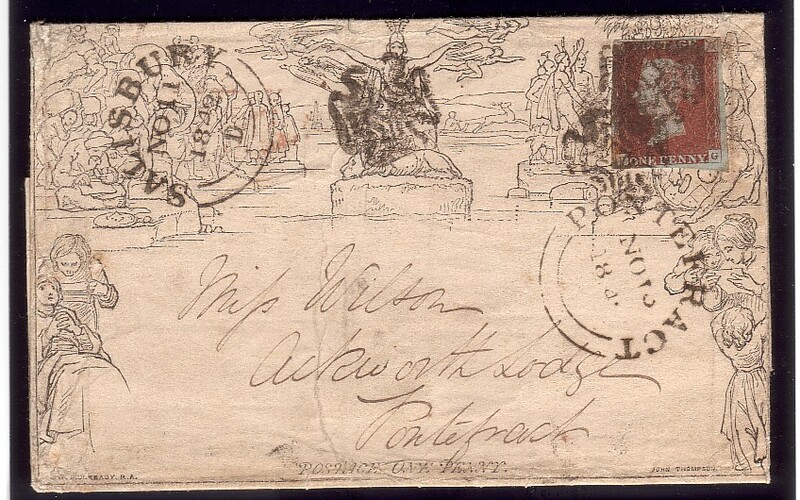 with fine London cds on reverse for MAY 9th 1840.
but a RARE early date of usage which is unrecorded by Jackson. The May 9th 1840 cds is of the London Chief Office - Evening Duty. Gibbons prices this from £2,600. The browning on the front and reverse side is a trick of the scanner. A collectable example of a very early usage. Bridgenorth September 29th 1843 date stamp and m/s ‘1’ in black. and sent on September 28th 1843. The handwriting is the same. 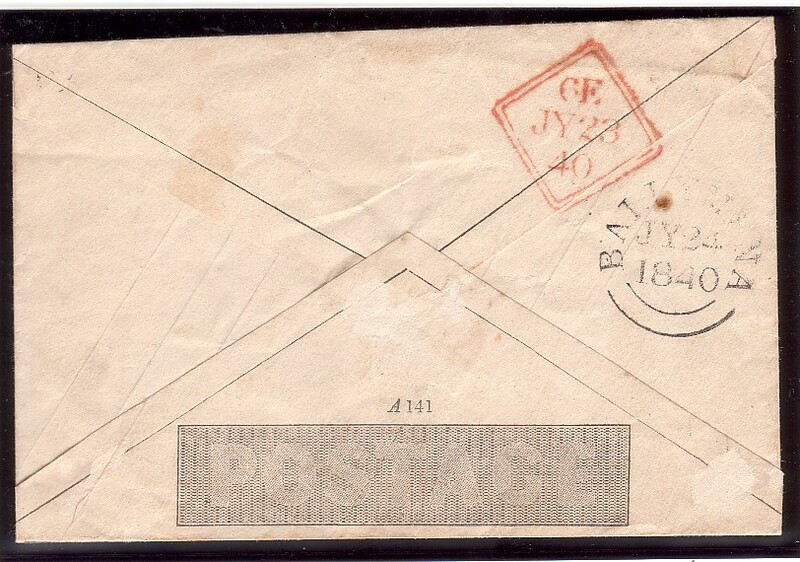 The front offered here was very probably sent on this same date as it was received in Bridgenorth the following day. 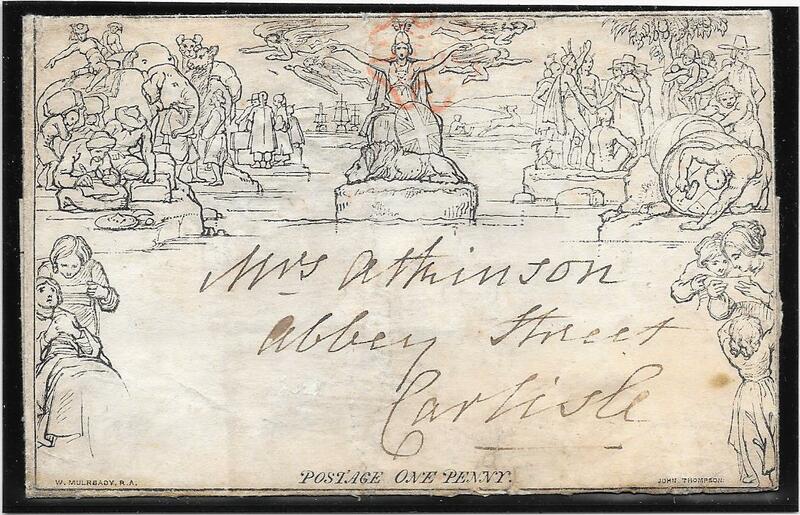 A remarkable item – Number 2 in Cross priced by Gibbons on a complete Mulready from £3,000. black ink for the MX came in officially on February 10th 1841 so this is a very early usage of black ink. We have not seen an earlier example of the black ink used in this non-regulatory manner. 151800. 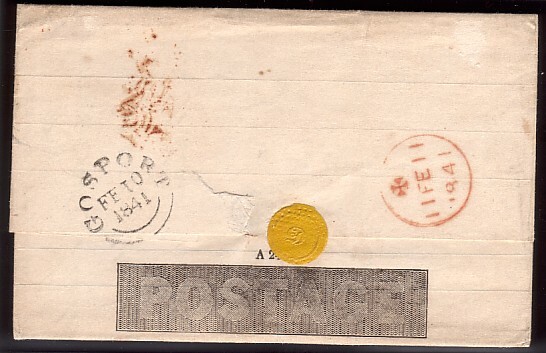 1d Envelope, A155, Forme 3, sent from NEW BRIGHTON to London. In New Brighton it was cancelled, Contrary to Regulations, by the New Brighton undated circle, County Cat. LL475. 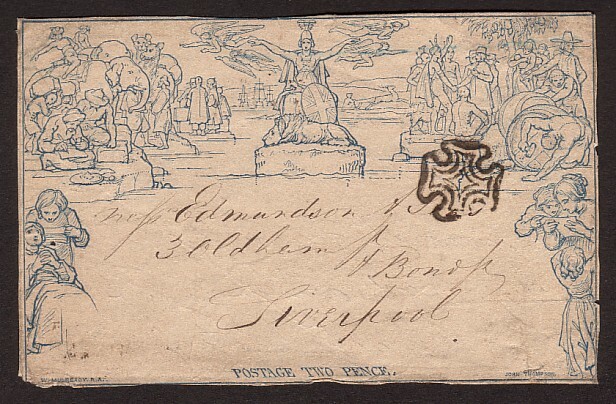 and on the reverse is a LIverpool date stamp, also in the same shade of orange, for July 26th 1840: a SUNDAY. 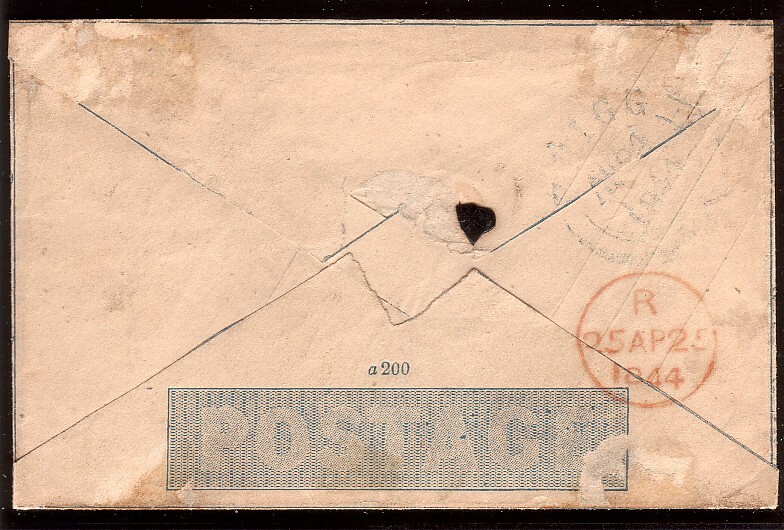 The envelope has a few small peripheral faults and there is a vertical crease on the rear which is only light on the front. 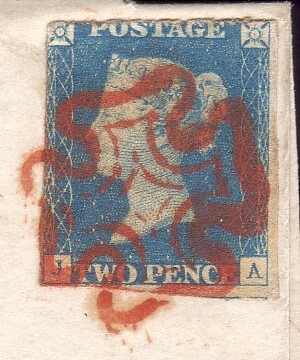 a combination of undated circle and Maltese cross cancelling Britannia. From our researches we can find NO OTHER EXAMPLE of a UDC and Maltese cross cancelling a Mulready. is priced by Gibbons at £28,000 on a 1d Mulready in the latest, 2011, Edition of QV Volume 1. The Liverpool orange cross is priced by Gibbons at £2,000. We have not seen this coloured cross used on a SUNDAY. The New Brighton UDC is recorded in use from 1842 so this example predates. An unrecorded Mulready rarity which is likely to be unique. which enjoyed views out to sea and across the Mersey and had a good beach. 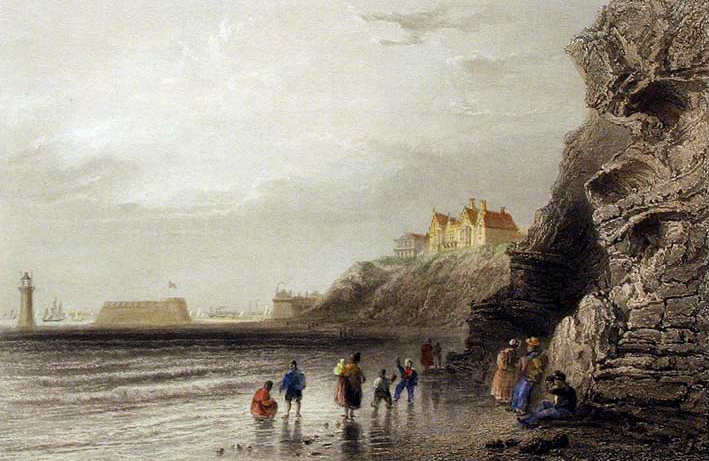 one of the most elegant seaside resorts of that Regency period. Hence he envisaged a 'New Brighton'. which is NOT present on the reverse and does not show in the scan. Priced by Gibbons at £350 in mint condition. 151799. 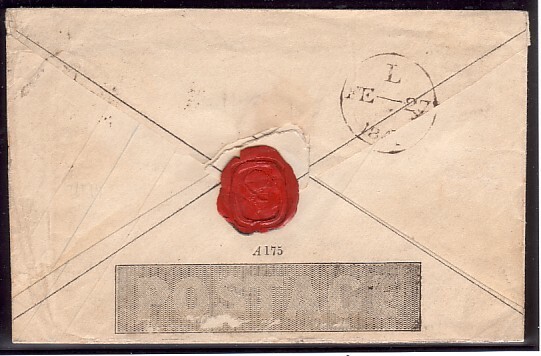 1d Letter Sheet, fine/very fine, stereo obscured by complete wax seal, to PLYMOUTH. On reverse are Brompton and Kingston date stamps for MAY 28th 1840. At the right side is a vertical PRE-PRINTING crease. Gibbons in the latest Edition, 2011, of QV Volume 1, prices May 1840 dates from £1,200. Possibly a unique usage of a pre-printing crease example in May 1840. NB: the item is much finer condition than the scan suggests: there are NO brown areas. 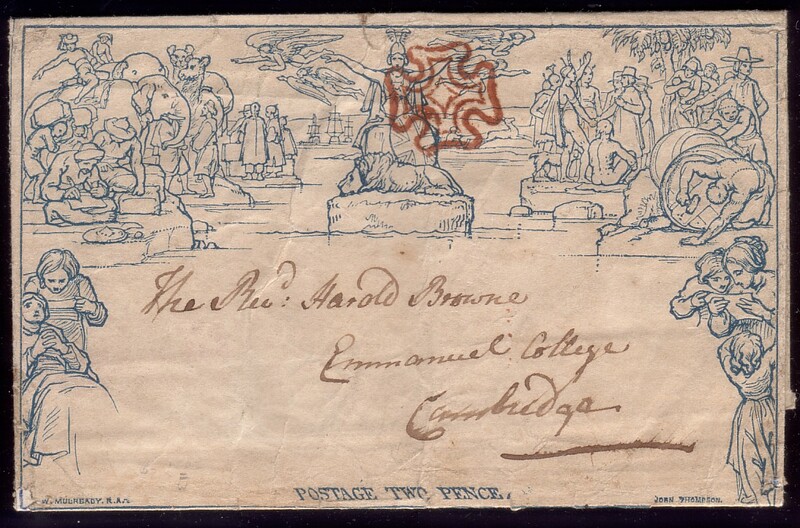 Scroll down for a 2d Blue Letter Sheet also used on May 28th 1840.
a variety well known for this location, listed and priced by Gibbons for the 1d black and 1d red but NOT for any Mulready envelope or letter sheet. 'this strange contraption courtesy of Mr William Mulready. Perhaps he should have stuck to painting sweet cherubic children'. 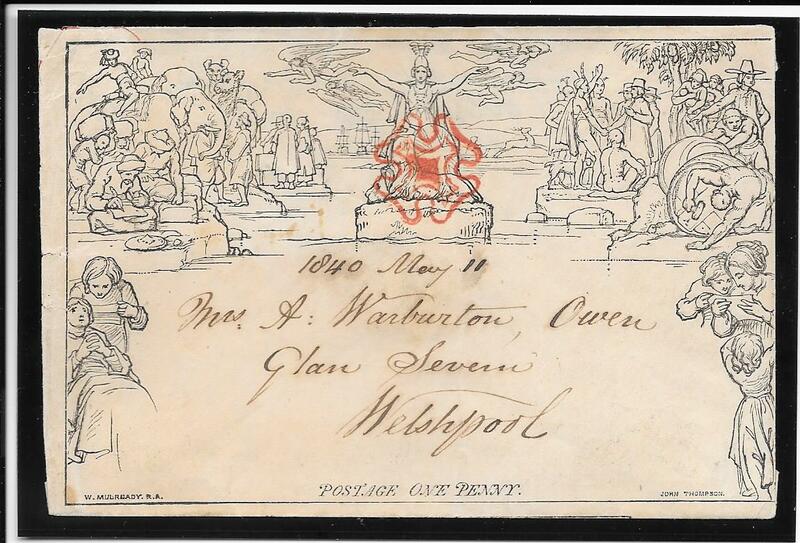 The Mulready envelopes and letter sheets had only been issued to the general public a few days before on May 6th 1840.
more info on the internet re Glansevern Gardens etc - the local Postmaster/Mistress did not bother to apply a date stamp after cancelling it with the MX. 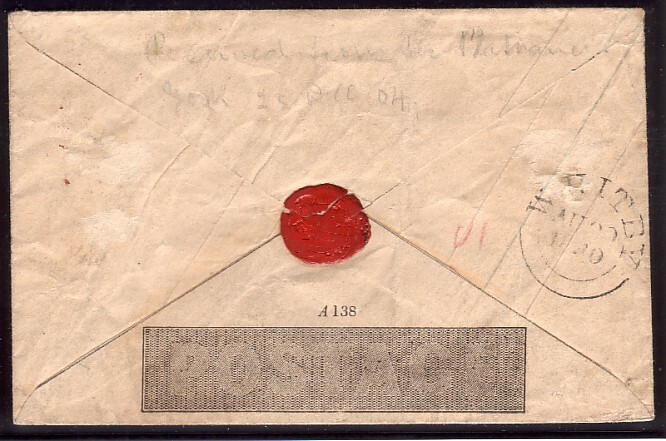 This is the EARLIEST KNOWN USAGE of this solid centre MX and the ONLY known example with a red cross. It is offered with a 2007 Certificate. a Gibbon's estimated price would be at least £20,000 for this rarity. into the general publics' reaction to the newly issued Mulready. fine example used from London, January 15th 1842, to HAMPTON COURT. NB: The Mulready is much brighter than the scan suggests. Family, Annuity, Life Assurance and Reversionary Interest Society, printed in BLUE, SG MA126a. on the reverse flap as per the scan but an extremely fresh and bright example. This item is from the scarcer Forme 5 and is especially scarce with a printed Advert. An estimated Gibbons price allowing for these factors is in excess of £1,300. An opportunity to obtain an overall fine example with this very scarce/rare combination of features. NOT cancelling Britannia and therefore contrary to Post Office Regulations. Very unusual to find the cross applied so far away from Britannia. 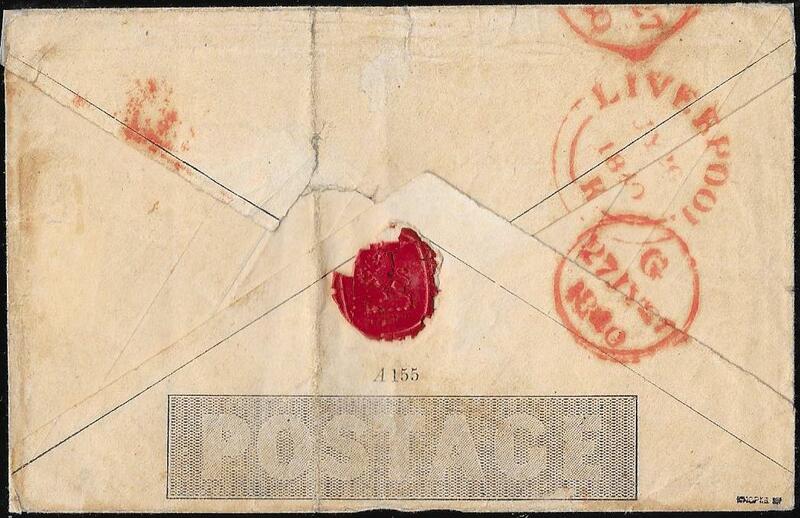 Part letter written on the reverse with some peripheral faults as per the scan. 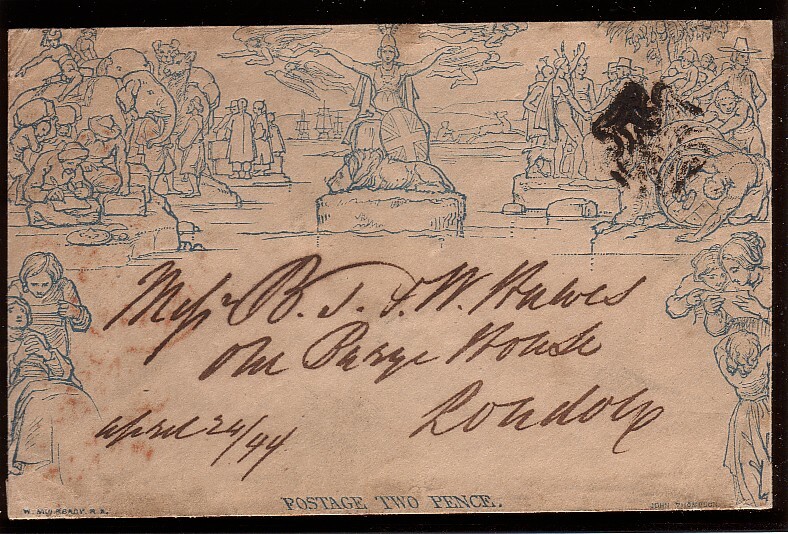 A full 2d Mulready priced by Gibbons at a minimum of £2,400. 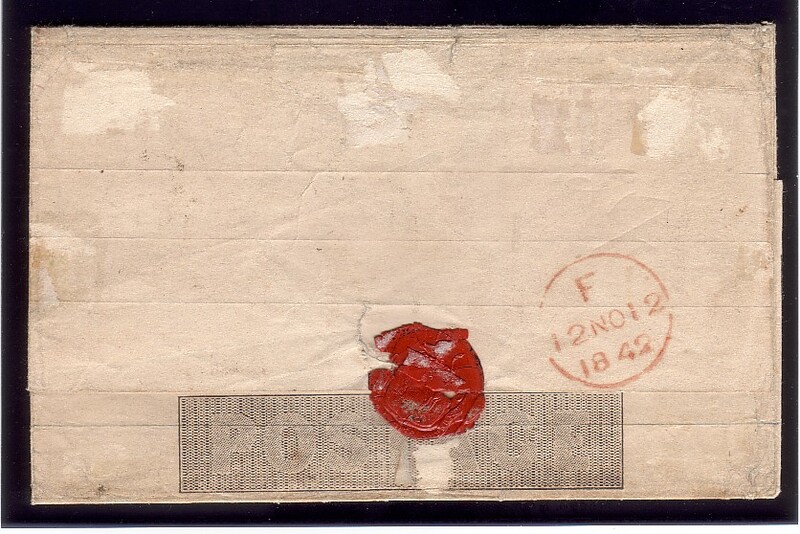 Attractive item and very scarce/rare even as a front. 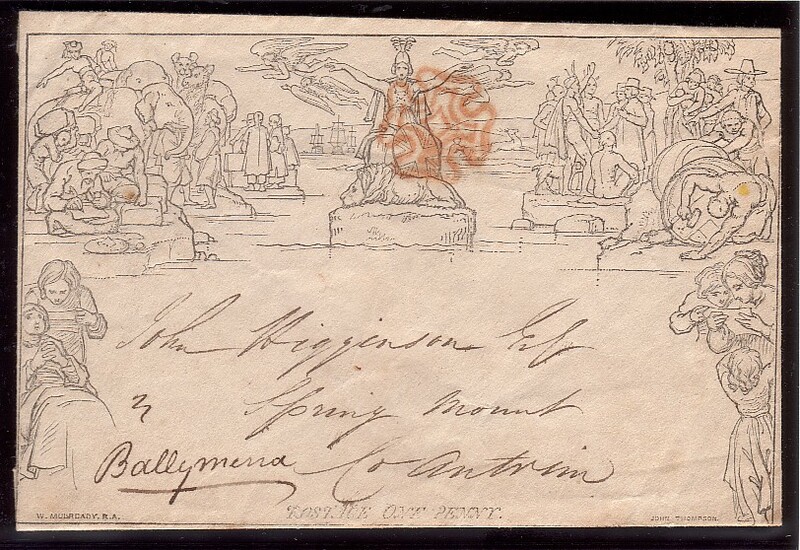 15135: 1d Mulready Envelope, A141 Forme 1, very fine/fine, used within IRELAND, Dublin to Ballymena, Co Antrim July 23rd 1840. Cancelled by a superb orange first type Dublin cross.Very scarce early Irish usage. 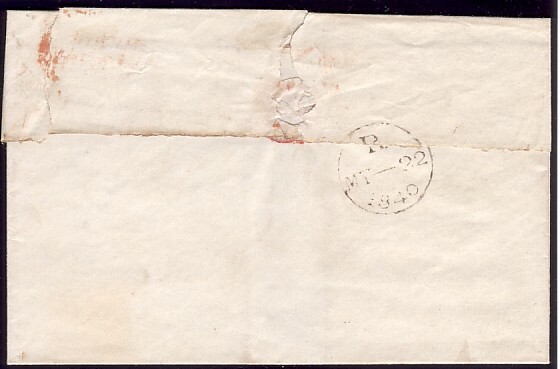 15138: 1d Mulready Letter Sheet, A232 Forme 6, from the rare second series. 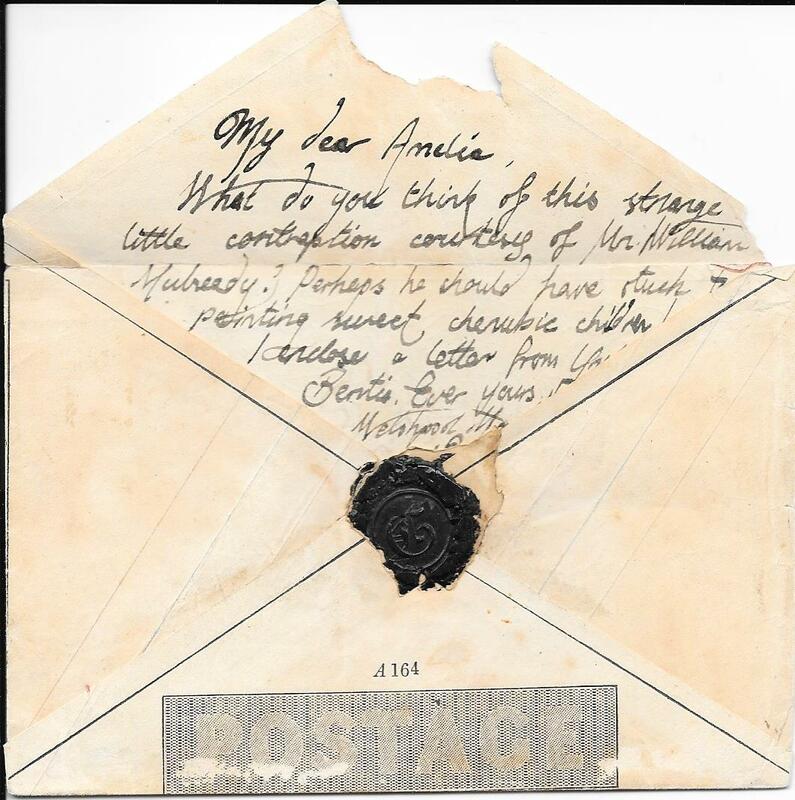 Sent to Fordingbridge, Hants, handwritten message inside. see Rockoff Volume 2, in order to cover up the d/arc date stamp. Regulations required that Britannia be cancelled only by a MX. 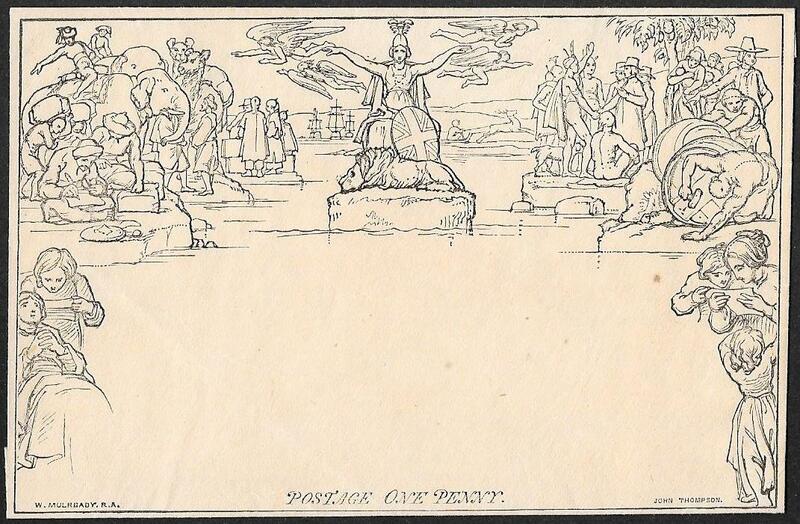 Indistinct date stamp but dated in manuscript 12/4/41 bottom left. Some creasing and surface marks but Forme 6 priced by Gibbons at £750. perhaps the Post Office was closed for the ‘Glorious 12th activities? by a very fine Gloucester cross which shows a double-line effect. This effect is noted by Rockoff and Jackson, Volume 1, page 117.
just a few days earlier than the example offered here, and note another example for November 2nd 1840.
to a Surveyor of Land and inside are hand written instructions. A rare combination of features and priced by Gibbons at £2,400. 293. 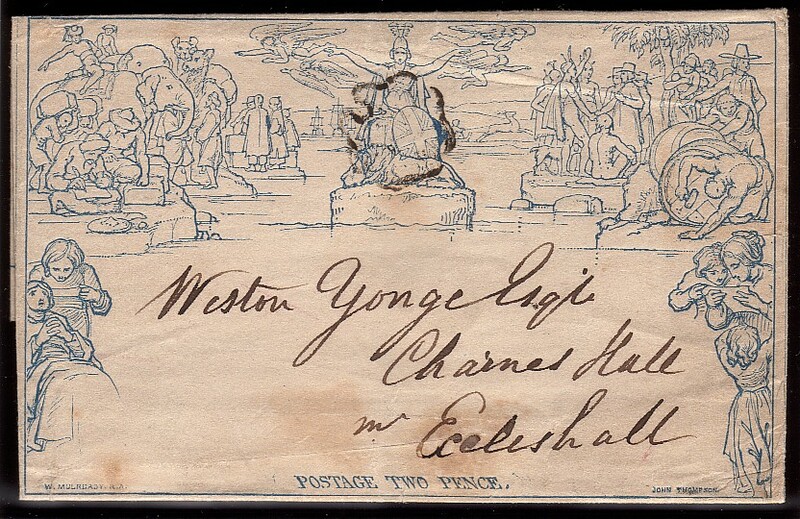 2d Mulready Letter Sheet a105: sent from STONE, Staffs to Eccleshall, 2nd September 1842. Some light creasing with a very light black MX leaving an unusual printing flaw on Britannia’s shield clearly visible. The population of Stone in 1841 was only 8,849. Priced by Gibbons at £2,400: a rare item. NB: the browning effects are not as pronounced as the scan suggests. none are on a 2d Mulready and the example offered here is later than those recorded. A Unique Quartet of Items used on May 22nd 1840. 15146: A unique quartet of items all used on the same date - MAY 22nd 1840. 1. 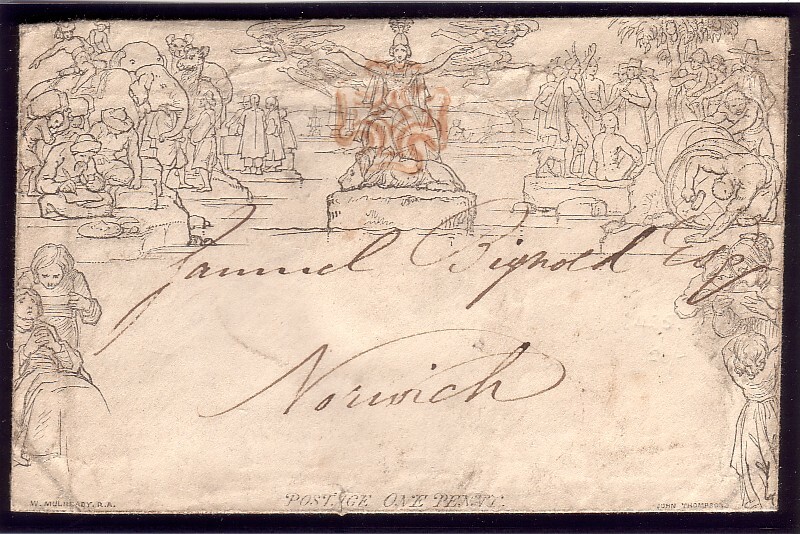 1d Mulready Envelope, A153, from Great Yarmouth to Norwich, overall fine with clear date stamp on the reverse. 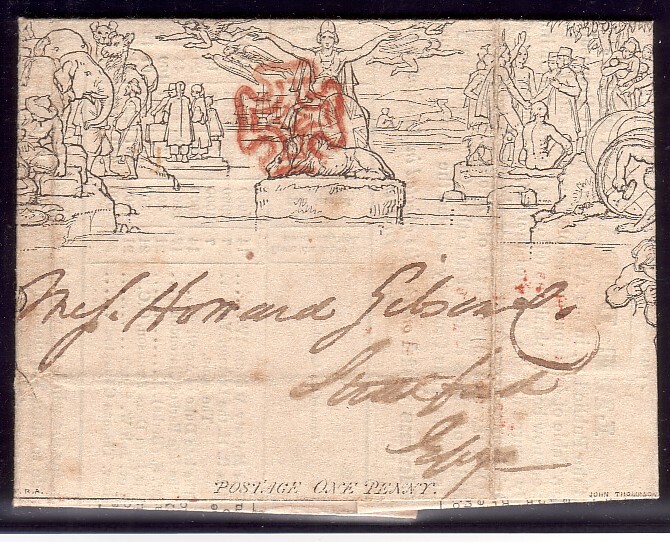 used on the First Day of Issue, May 6th 1840! fine red/orange cross. 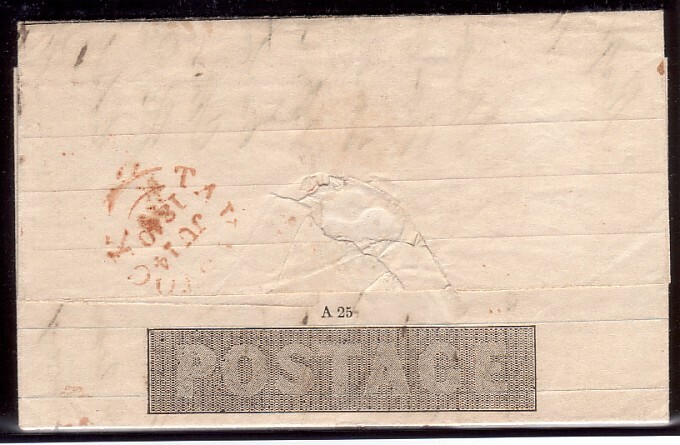 London date stamp on reverse top flap, unrecorded by Jackson Code ‘O’ for evening duty. 4. 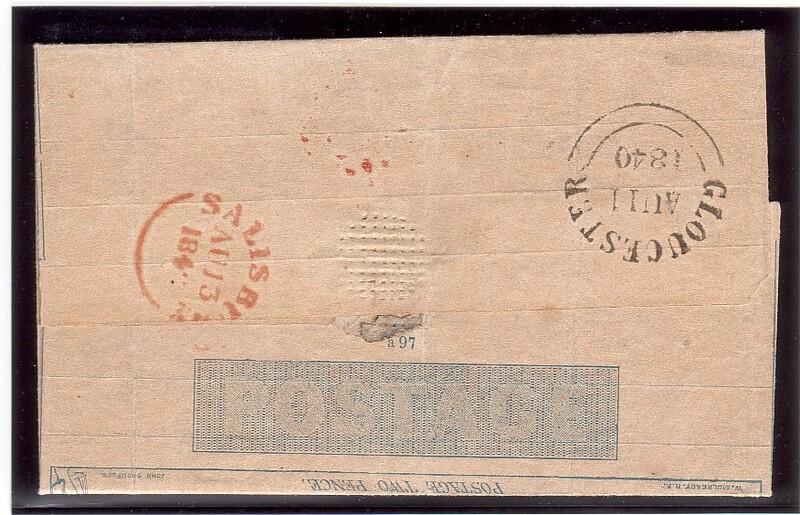 2d Blue, Plate 1, ‘JA’, not full margined but tied to a wrapper from London to Truro by a very fine and superb red/orange cross. 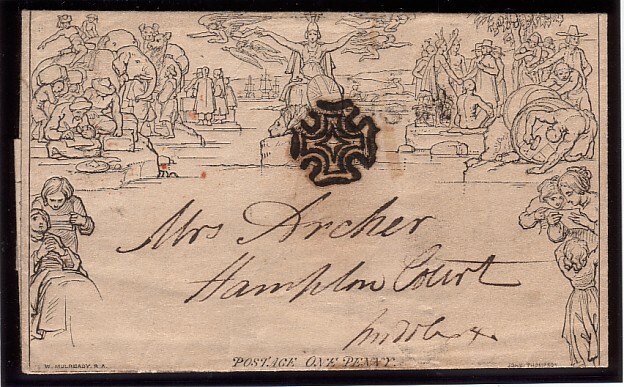 May 1840 which includes pieces as well as full covers but 86 1d black First Day of Issue examples. 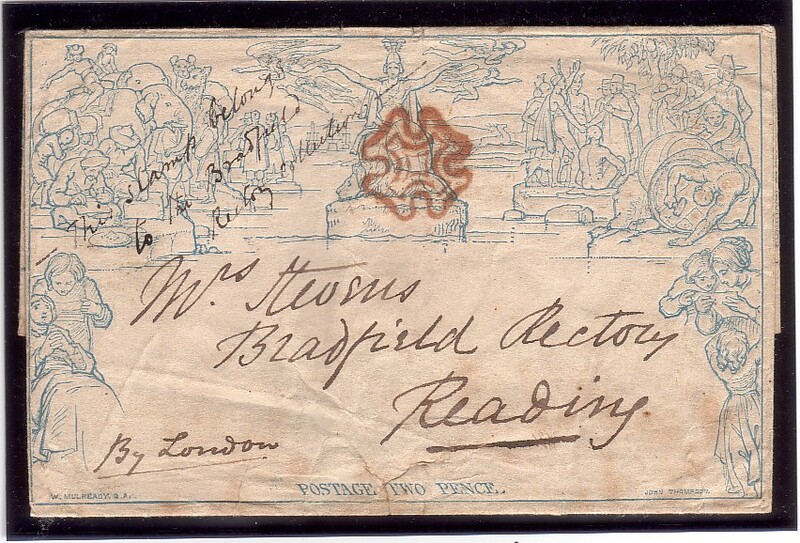 Neither this 2d Mulready nor the 2d Blue wrapper are recorded in Jackson’s book of May 1840 usages. 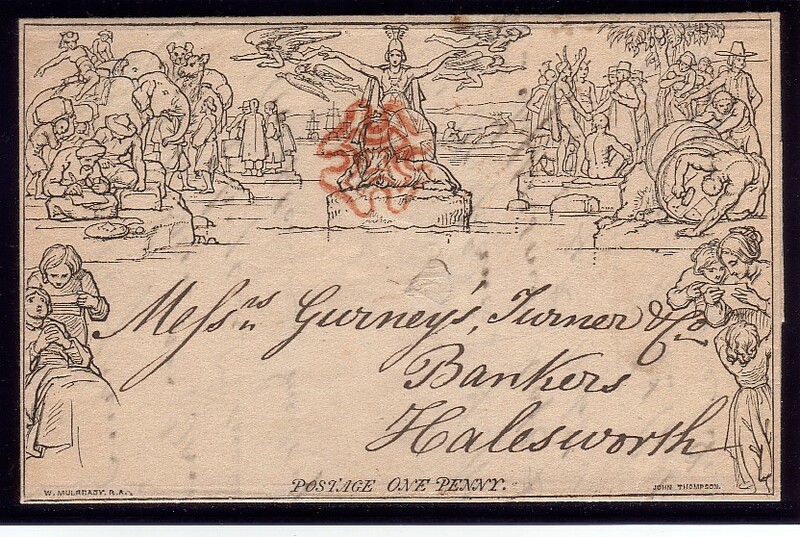 2d Mulready wrapper - £17,000. A truly remarkable and unique grouping with a total Gibbons price of £38,500 (2011). 15087. 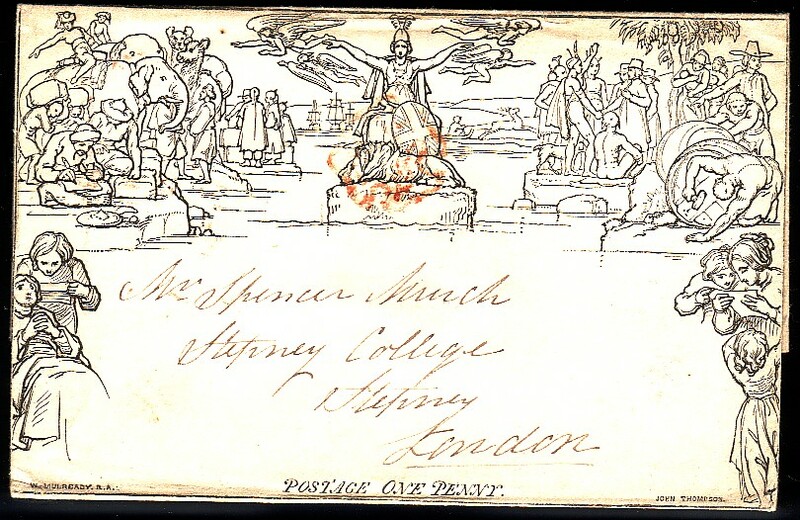 1d Mulready Envelope, A149, Forme 2, envelope from Chichester to London, MAY 9th 1840. 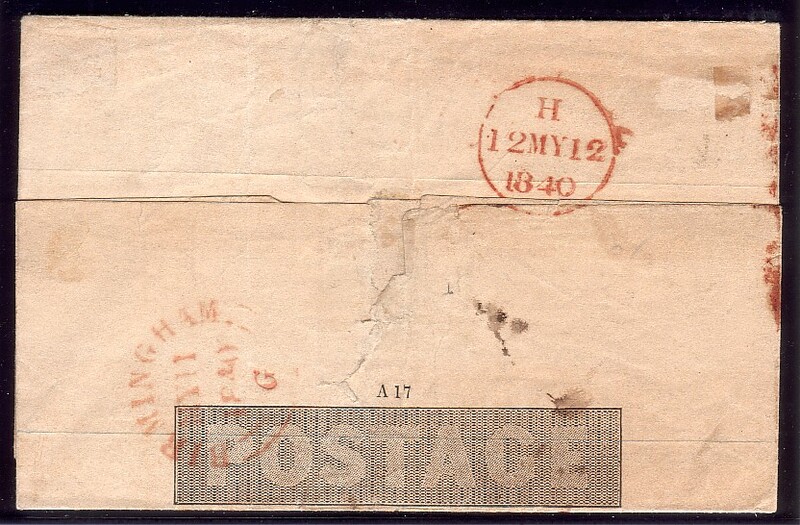 Chichester date stamp on the front. Some creasing/wrinkling but for such an early date it is in fine condition. 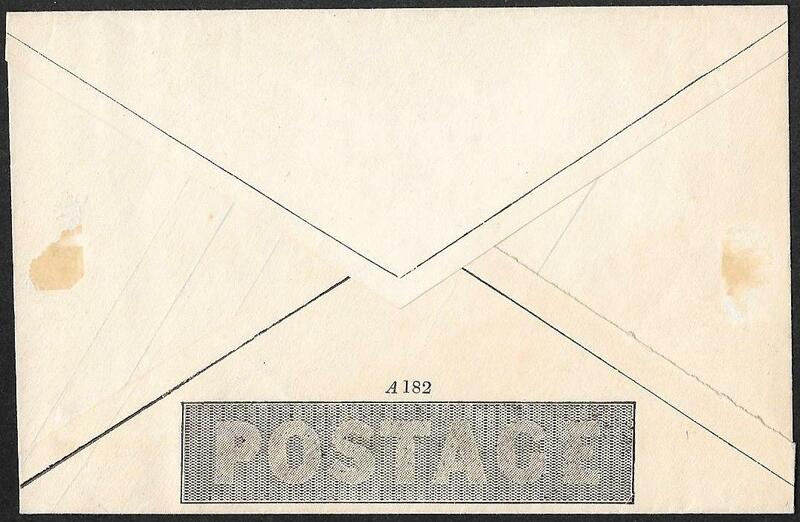 seven previously recorded envelopes used from origins outside of London on this date. 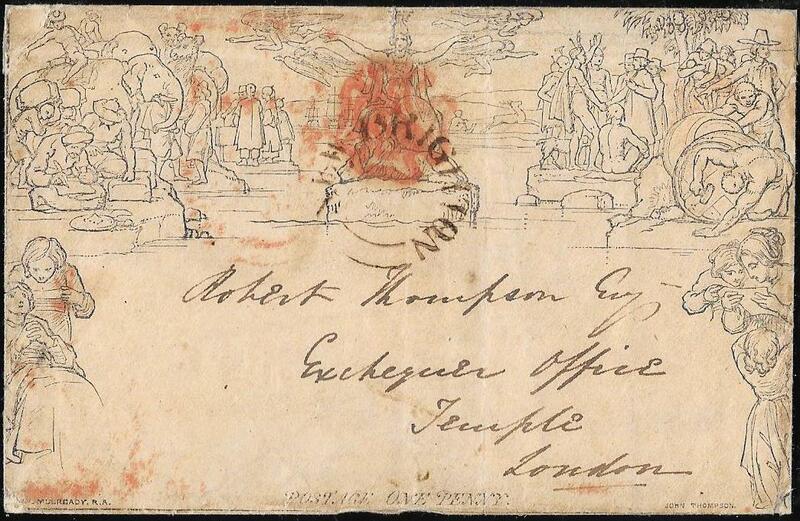 On the reverse a London receiving date stamp for May 11th 1840 : May 10th was a Sunday. With RPS Certificate and catalogued in the latest QV Volume 1, 2011 at £2,600. 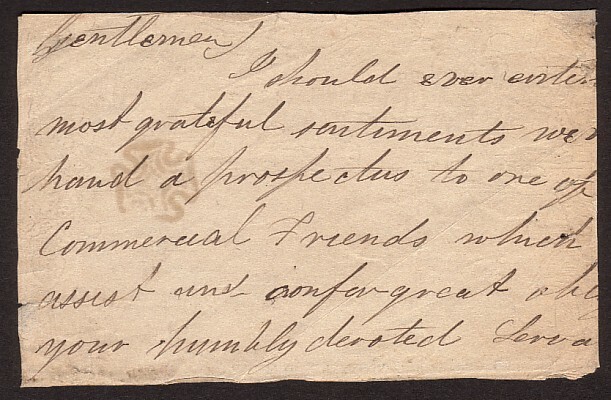 The first May 9th 1840 example we have been able to offer from a provincial location. 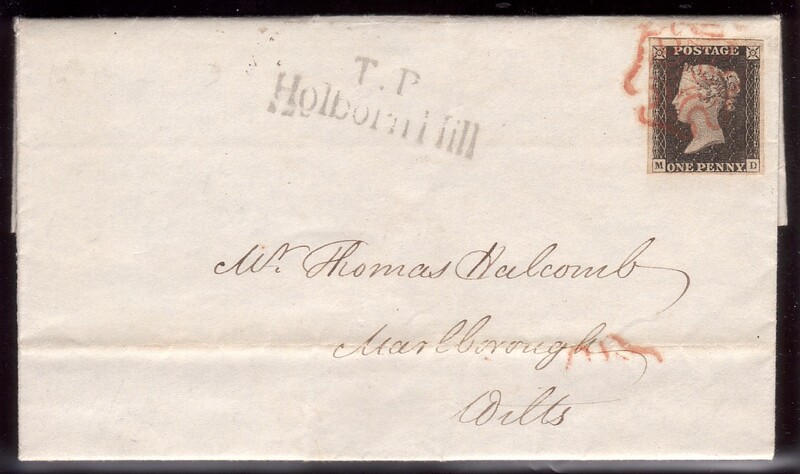 1d Mulready Letter Sheet, A17 Forme 2, Birmingham to London, MAY 11th 1840.
typically oily and characteristic of Birmingham in this early period of the Maltese cross usage. This would have been caused by excessive oil in making up the red ink. 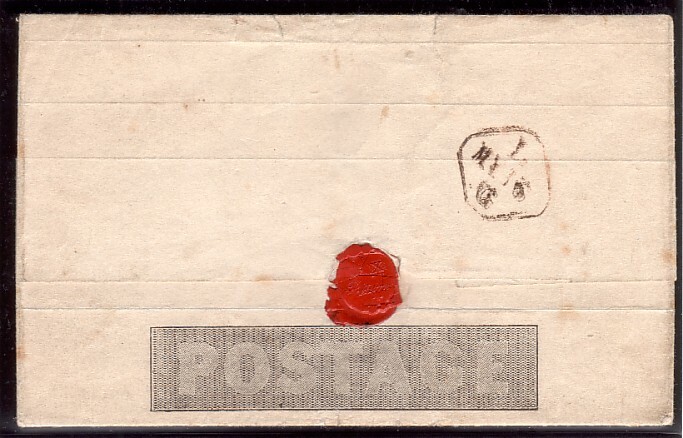 that had been sent by the General Post Office. Only FOUR earlier examples than the one offered here are recorded by Rockoff . 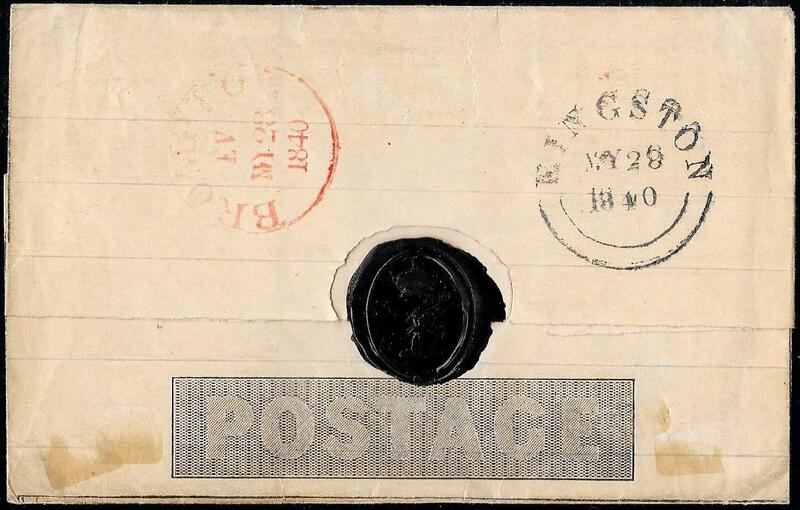 Some faults on the reverse as per the scan but fine for such an early use. Gibbons prices FROM £1,200 in QV Volume 1, 2011 Latest Edition for a May 1840 usage. It is addressed unusually to Old Red Cross, a pub in Smithfield and to the Publican Wm Stogdell. Details are available on the internet of this well known pub. 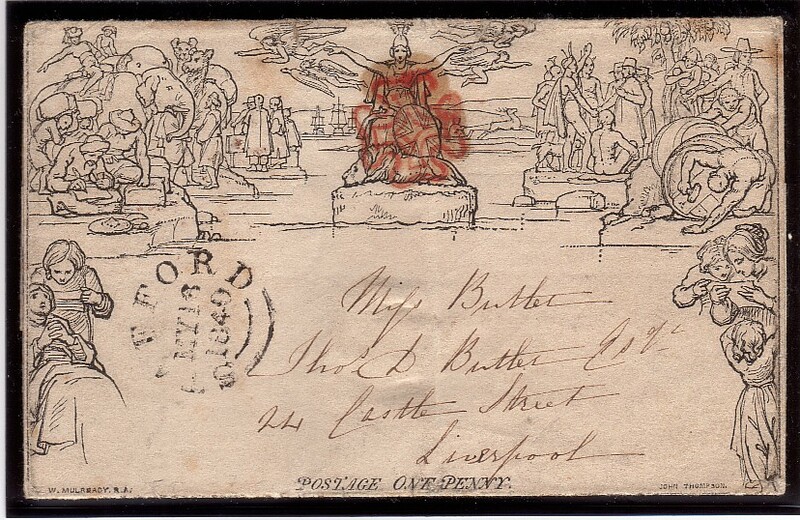 1d Mulready Letter Sheet, Stafford to Liverpool, MAY 16th 1840, Stafford date stamp on the front. of a type usually applied on all mail going overseas from Liverpool. We have not seen this date stamp used before on a Mulready. Rockoff and Jackson do not record the STAFFORD CROSS. Priced by Gibbons from £1,200 in 2011 for a May 1840 usage. 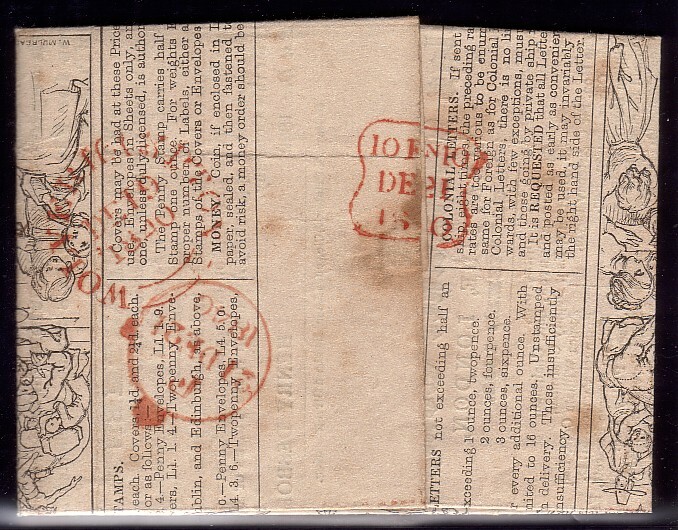 used on MAY 24 1840, the third SUNDAY after its official issue. which displays the Bath upright date when the rear flap is raised. but no price is quoted for a SUNDAY May 1840 usage. It is certainly as rare or rarer than a used 2d Mulready: Gibbons price £2,400. 15090. 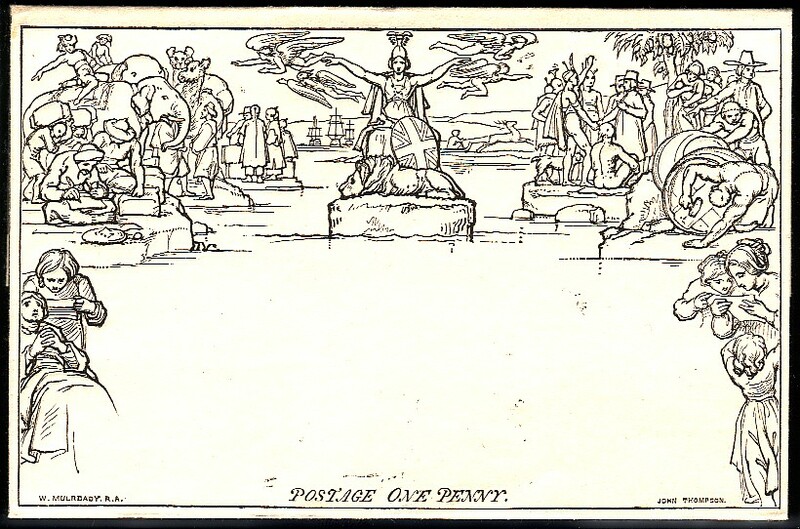 1d Mulready Letter Sheet, A25, Forme 2, commercial hand written letter from Tavistock to Penzance. hence presumably he was using this very new means of communication. and the 6th Sunday after the Mulready was issued. allowing the finest of detail in the design to be clearly seen. 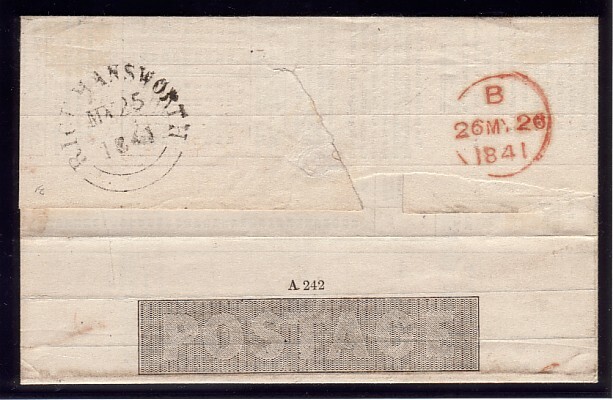 Attractive example and very scarce sent to a Cornish destination. 15091. 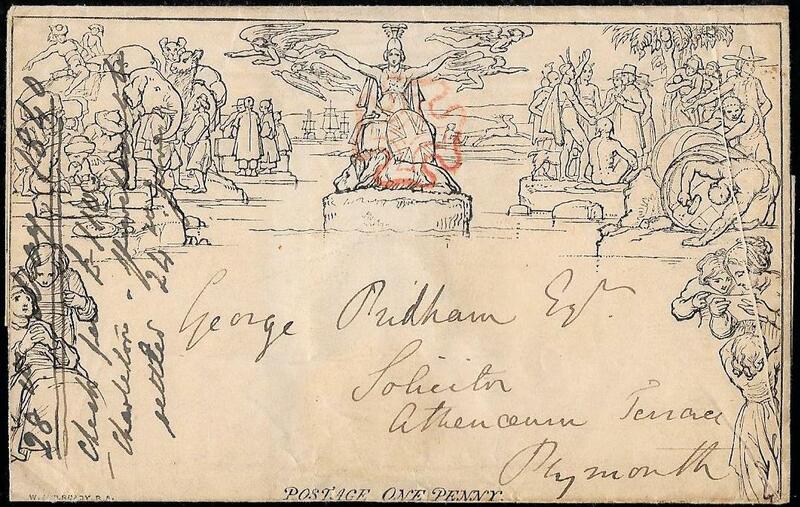 1d Mulready Letter Sheet, A241 from the scarce Forme 5 catalogued at £750. 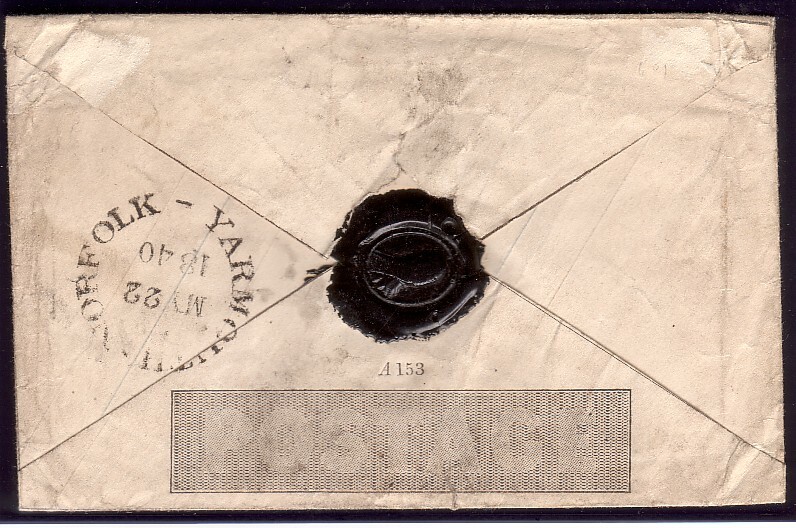 with a cds for July 28th 1840 on the top flap which displays well when raised. 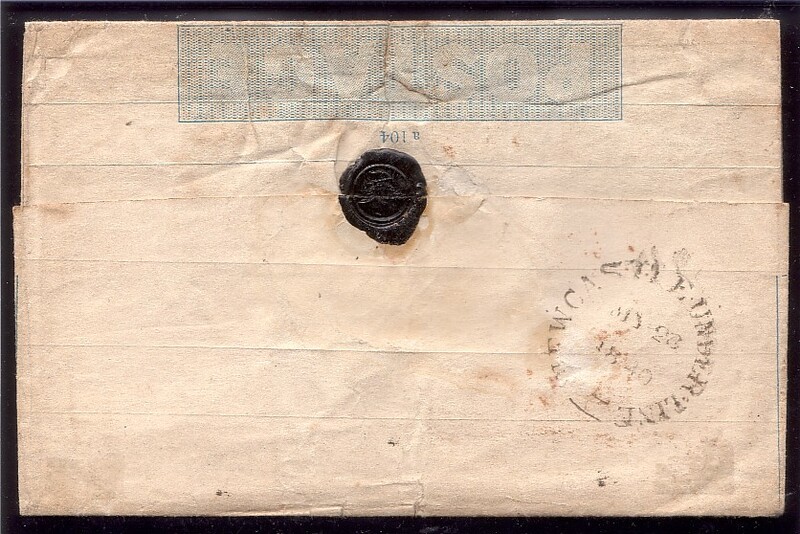 an embossed paper seal with impressed initials was used. The first Mulready we can recall sealed in this way. A very fine and attractive item. 15092. 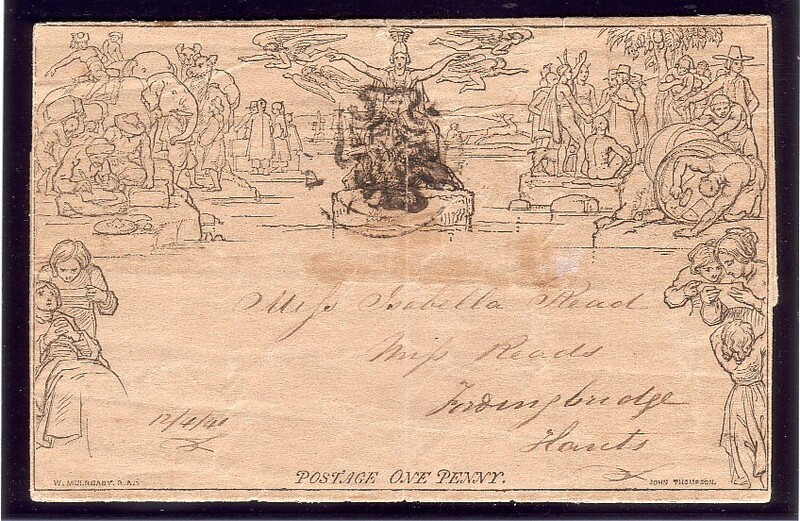 1d Mulready Envelope, A138, Forme 1 to York from Whitby, August 20th 1840. 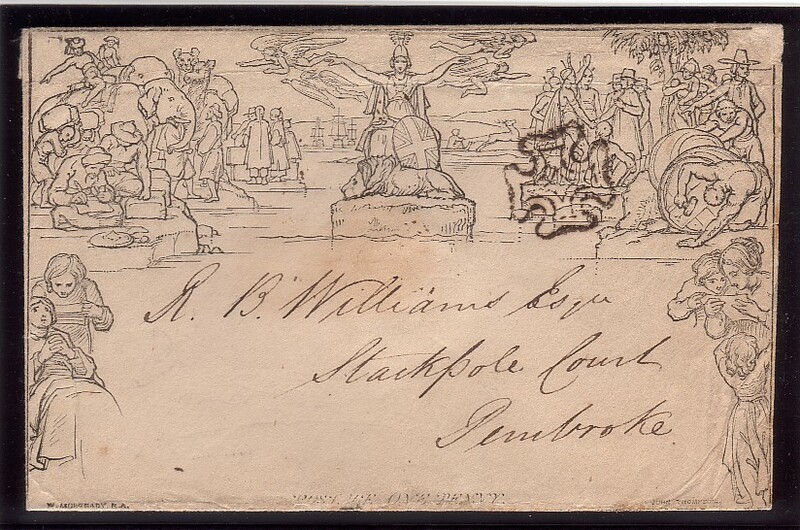 The only Mulready from Whitby we have seen but in Rockoff Volume 2 page 341, he notes another 1d Mulready from Whitby used on 28th February 1841. 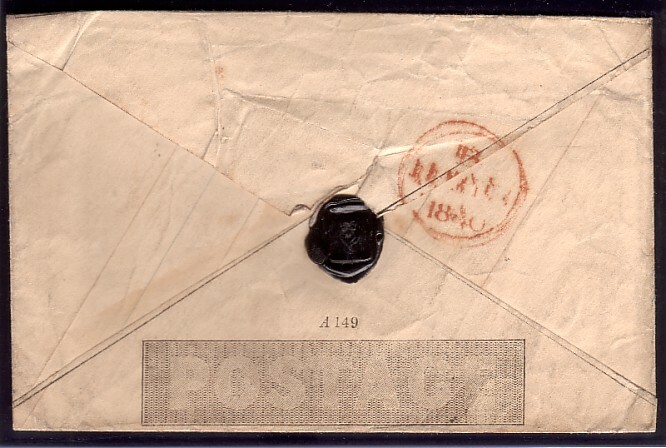 On the reverse is a pencil notation indicating that this was received as a present on December 25th 1904! The apparent diagonal crease in the centre is a pre printing fold in the paper and not as pronounced as appears in the scan. 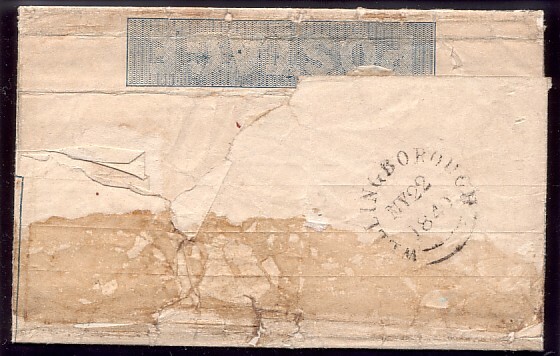 Unusual folding and application of date stamps. 15093. 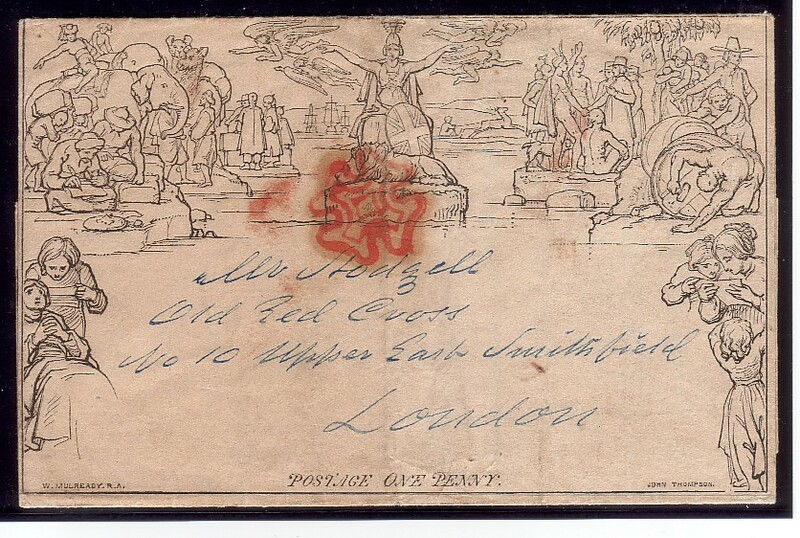 1d Mulready Letter Sheet, A18, Forme 2, Wolverhampton to London, December 19th 1840, superb orange/red cross. is visible with the side flaps now on the back of the letter. 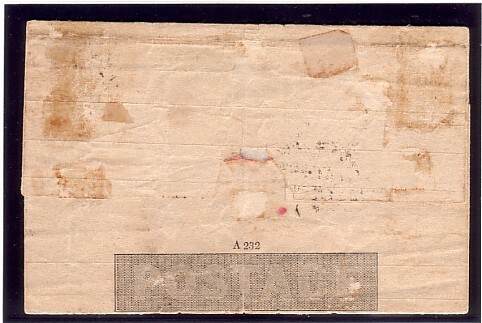 Hence the well-struck transit date stamps are cancelling parts of the sheet that are usually inside! We have never seen a Mulready used in this way. 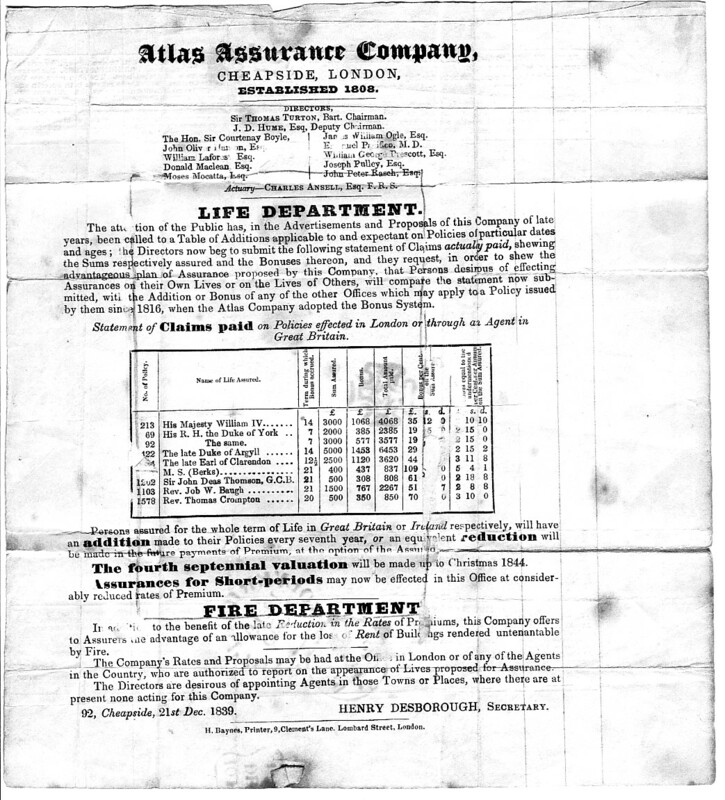 for the Atlas Insurance Company with a printed date of 21st December 1839. Company’s eleven types of Advert listed by SG in the Latest QV Volume 1 and priced at £825. The combination of features certainly makes this a unique Mulready. 15095. 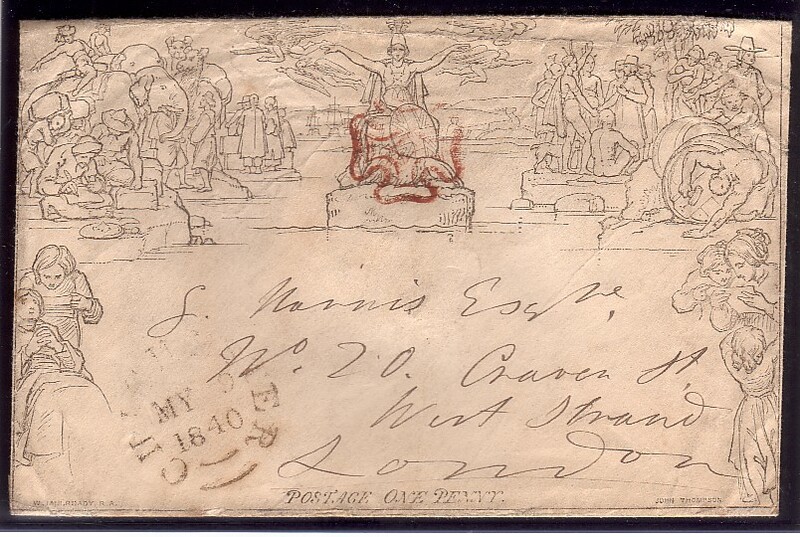 2d Mulready Envelope, a200, from Brigg, Lincolnshire to London, April 24th 1844. Overall toning but the scans as usual do not do the item full justice. many people in this very small rural community could write at that time? 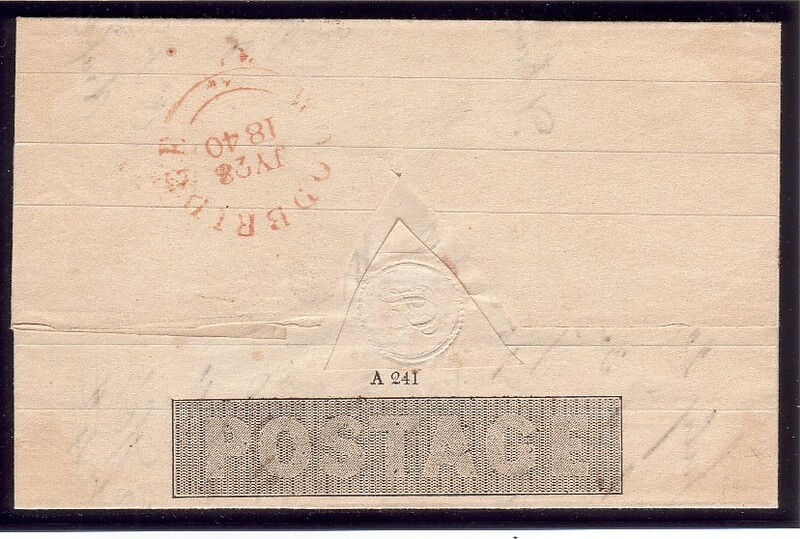 Brigg because the MX has been applied close to where an adhesive stamp would be affixed on a normal envelope or letter. The MX cancellers were replaced in provincial locations on May 1st 1844 by numeral cancellations and in Brigg by a ‘129’ numeral which is itself very rare. This MX, used on April 24th 1844, is the LATEST usage of an MX on a 2d Mulready we have seen. Catalogued in the 2014 Edition of GB Concise at £2,200, this is a rare item with likely a unique combination of features. had not read the GPO’s instructions for the changing of ink colour? A full yellow wafer seal on reverse. Rare combination of features. of the finest we have seen or handled. Rare item in this condition.